The IRCAM's Multimedia library is a specialized library, both the living memory and of an institute and a rich platform for experimentation with new technologies for musical documentation. The collaboration between Ircam and the CNRS has resulted in a common collection of books, periodicals and scores. The IRCAM's Multimedia library collections cover contemporary music and the science and techniques associated with it: computer science, signal processing, acoustics, sound analysis and synthesis, perceptive sciences. In complement to the paper documentation (monographs, periodicals, and musical scores) there is also a large electronic collection. 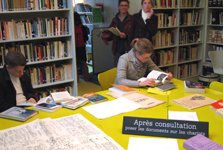 Visitors can also access a part of Ircam’s sound archives that contain concerts and conferences, articles published by Ircam researchers, Ircam publications (books and periodicals), and concert notes. Videos, CD's, a database on 20th century composers, scores synchronized at the time of their performance, musical analyses with sound excerpts and two web sites "Voice and Computer" and "Instrumental Sound" are available for perusal on terminals in the media-library.